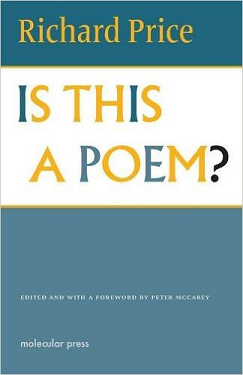 Richard Price has written about literature for over thirty years, focussing on the wider role poems, artist's books, and little presses play in the communities they to some extent create. Is a lyric poem really what it's thought to be? In IS THIS A POEM? Richard Price reverses conventions to see poetry in an entirely different light. "Investigative work on the function and importance of ‘little magazines’ has been another growth area in the past decade or so, and David Miller and Richard Price's British Poetry Magazines 1914–2000: A History and Bibliography of ‘Little Magazines’ is one of the major recent projects in this area. This volume is a major research tool which all university libraries ought to possess." The English modernist Bunting receives critical attention from Philip Hobsbaum, Roy Fisher, Gael Turnbull, Harry Gilonis, Parvin Loloi and Glyn Pursglove, Jonathan Williams and others. Many letters by the poet are also published for the first time. As well as co-editing, Price contributes an essay on Bunting and patronage. The topics covered by the various contributors include: Hugh MacDiarmid's debt to Paul Valéry; Proust's influence on Neil Gunn (this is Price's contribution); the relations between Ian Hamilton Finlay and the French Revolution; the translation into Scots of the work of the Quebec dramatist Michel Tremblay; the intertextual contribution of Zola to the work of James Kelman; Frank Kuppner; the career of the Scottish-French poet Kenneth White; and the French presence in recent Scottish fiction including that of Alasdair Gray, Ronald Frame, Janice Galloway and A.L. Kennedy. An appendix provides an extensive list of French translations of Scottish literature published during the 20th century. An introduction to the novels of Neil M. Gunn whose work came to prominence in the 1930s with the perceptive study of sisters and their young brother Morning Tide and Highland River, a quietly modernist reflection on the First World War which in form and philosophical approach could be said to anticipate the work of W.G. Sebald. Price places Gunn firmly within the international modernism of the time while paying close attention to particularly Scottish contexts.